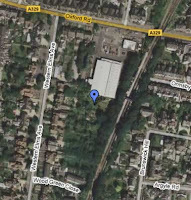 We are on Western Elms Avenue, just behind Lidl and Dreams. From the Oxford Road, walk up Western Elms Avenue on the left hand side until you come to some parking garages - just after those and before the next houses, turn left and you will see the gate to the garden. This is locked and members hold a key. To apply for a key contact us as above.